Airline meals have a bad reputation. Those silver trays containing who knows what, alongside a plain roll and a limp salad. Many people view airline meals with disgust. Add to this the whole experience of attempting to eat this meal in a tight economy seat. If the person in front decides to recline and the one next to you has their elbows as wide as possible, you face trying to eat that hot and saucy pasta while positioned in the fetal position, with your arms like a T-Rex. Another issue is that more and more airlines are charging passengers for even ordinary food like soggy sandwiches and packets of potato chips. The good news is that a lot of airlines still provide meals to their guests and some are doing exceptionally well at it. Most airlines offer food you would find in a fine dining restaurant. However, they are usually confined to First and Business class. 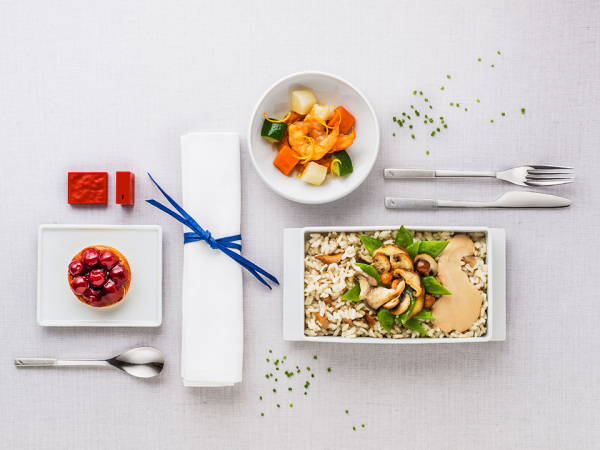 We take a look at the top ten airline meals in any class for 2017. Most of the photos are from First and Business Class meals, but there are some airlines that also present tasty dishes for their Economy passengers too. In our list, links are also provided to the respective airlines' website if you want to take a closer look. One of Swiss International Airlines' gourmet meal options. Swiss International provide complimentary meals in all classes. They are all regionally inspired dishes and you can also expect that delicious Swiss cheese on long-haul flights. 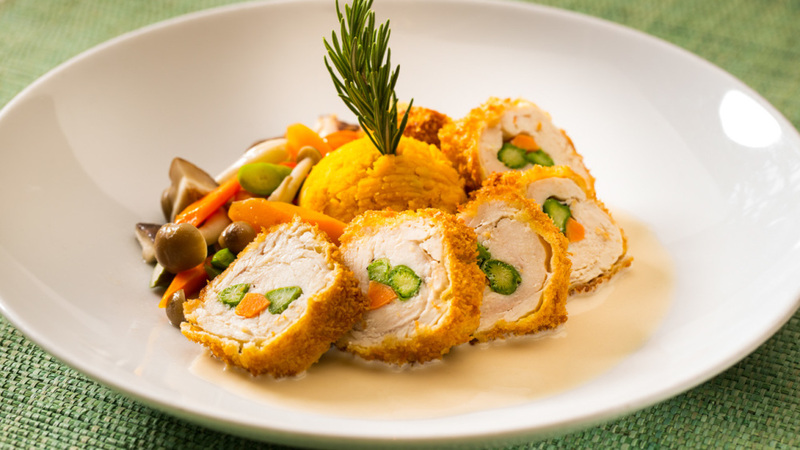 In the premium classes, their Taste of Switzerland menu highlights different regions every three months. 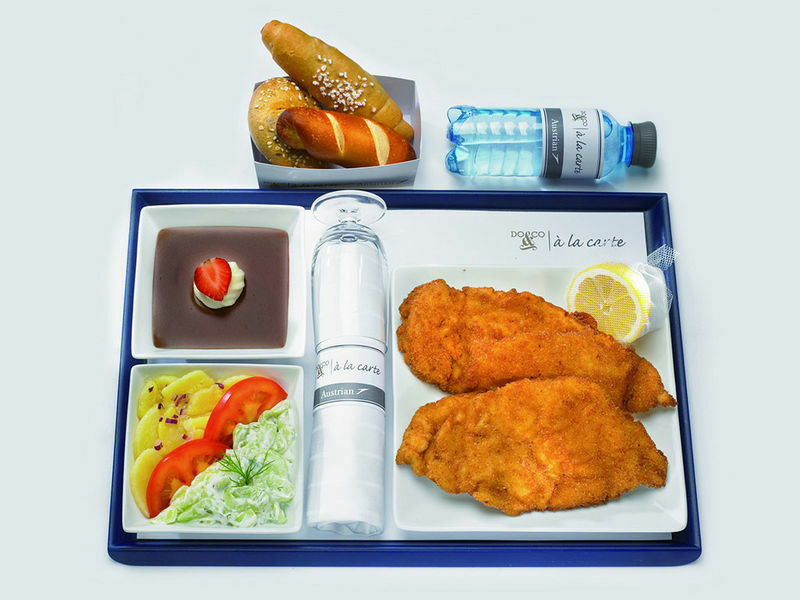 For a fee, you can also purchase gourmet meals (like the one in the image), on intercontinental flights. Attractively colourful Business Class dish. As the only US domestic carrier to still provide complimentary hot meals, Hawaiian deserve a special mention. The other great news is that their food is taken from local cuisine, meaning you can enjoy a tasty fusion of Asian/American dishes with an island flavour. Plus, the food looks supremely attractive! Economy Class breakfast and main meal. LATAM have a reputation for serving excellent food in all classes. Now that all the original LAN subsidiaries have combined, there is potential to explore a huge range of South American food. Word is that breakfast has a special place among loyal LATAM customers. Even if you're in economy, you will get a complimentary snack and drink at a minimum on short flight. As the length of each sector increases, so does the food available. On longer flights of over 7 hours, LATAM will serve you 2 meals. Austrian works with a Vienna caterer called DO & CO that specializes in gourmet catering. For around €15, you can pre-purchase some fantastic dishes - including their famous Viennese schnitzel. On long-haul flights in Business, they also have an on-board sommelier to assist passengers to pair their meals with the perfect wine. Are you a lover of coffee? You'll be pleased to know that they offer 11 different kinds of coffee on board. 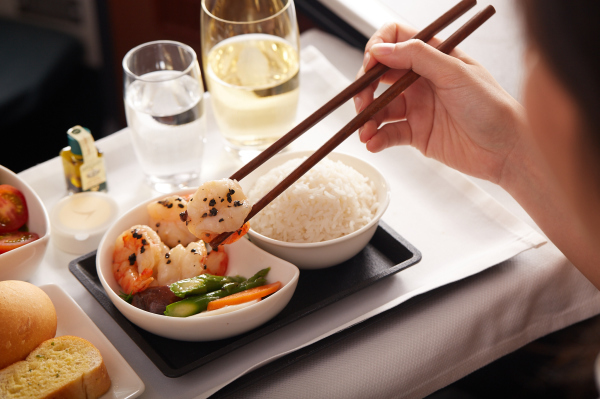 First Class on Air France features fine dining meals created by Michelin star restaurants. When you think of France overall, food is one of the factors that make French... Frenchy. Luckily for Air France passengers, the French also take their food seriously in the air. 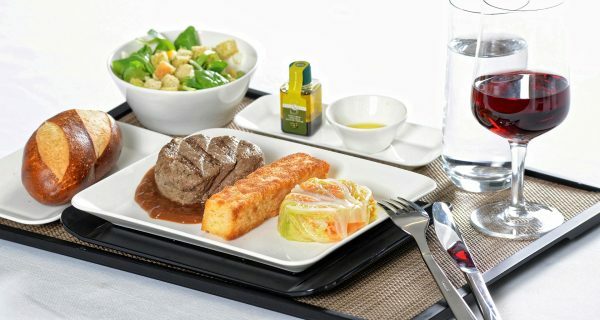 Their exquisite service and perfection in their airline meals aims that you'll experience a perfect meal every time. Their La Premiere Class (First Class) meals are some of the best in the world. If you're lucky enough to experience it, you'll be treated to a restaurant-style service complete with Michelin-star food and fine china, as only the French know how. Even if you're in Economy, Air France set up a snack bar on long-haul flights with goodies like Haagen-Daez ice cream and other sweet and savoury treats. New Zealand is very far away from anywhere, meaning a flight with their national airline will be long-haul (unless you're flying to/from Australia). The great news is that their airline meals are simply wonderful. 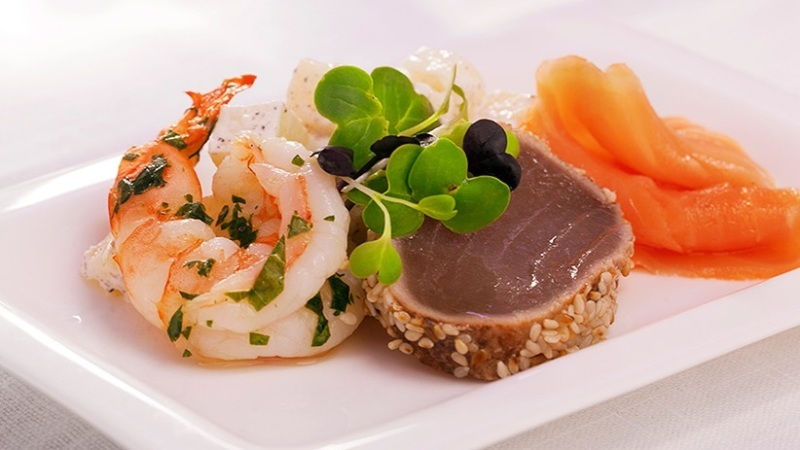 Air New Zealand have championed the use of fresh, local food in all their classes of travel. As a result, all of their meals are delicious and when combined with their sensational local wines, you will surely enjoy the offerings in any class. Business Class meal on Cathay Pacific. Cathay Pacific were the first airline to introduce cookware on board in order to provide customers with fresh food made to order. Also, being based in Hong Kong, their food offerings are excellent in all classes. This really steps up in premium categories where you can expect high quality food not unlike you'll find in the best restaurants in Hong Kong. I also like the fact that you can grab snacks and drinks in their galley at anytime during the flight. Even Economy Class meals on Turkish are sensational. Pretty much every person that flies with Turkish Airlines raves about the food. The quality, range and taste has a marvelous reputation in the airline industry. Along with a handful of other airlines, their long-haul flights feature an on-board chef who is in charge of all the meals for passengers in First and Business Class. Economy doesn't miss out either, with a superb range of tasty dishes. And while other airlines increasingly charge for food on short-haul, Turkish pride themselves on providing complimentary snacks and drinks on even their short domestic flights. Emirates seems to have a passion for taking things to the extreme. This is (usually) great for passengers, especially those in First Class. Those fortunate enough to experience it can expect a 7-course meal, complete with Iranian cavier and gourmet food fit for a sheikh. Naturally, this is served up on Royal Doulton fine bone china to ensure you don't miss out here either. If you're on one of their A380s and get peckish between meals, you can indulge in luxury canapes served at the lounge bar. 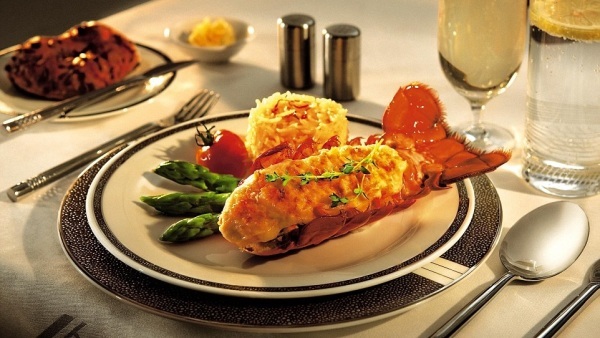 Lobster Tail in First Class. The great thing about flying with Singapore Airlines is that they do everything so well. You're pretty much guaranteed a perfect flight. The same goes for their superb food. Singapore work closely with many top-rated chefs from around the world to create their menus in every class. They also have a service called "Book the Cook", where passengers in all classes, except economy, can pre-select a gourmet meal up to 24 hours before departure.